Welcome to the website of Jobmaster, Inc., a family owned full-service cleaning company based out of Central Florida for over 25 years. Please enjoy our site and email or call us with any questions you might have. Jobmaster is a family-owned local non-franchise business. Since the 1980’s we have grown from a one-man operation to over 30 employees, over 7000 sq ft of offices & warehouse, and hundreds of accounts throughout the Central Florida area. As a company policy, we refuse to pay anyone minimum wage. We work hard as a team to provide quality service for our customers and a living for our employees. 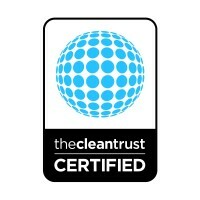 We are a Certified Firm with the IICRC / Clean Trust. Feel free to check out their consumer site or their main site (available in the Links) to find out more of what being a certified firm entails or our IICRC page by clicking these logos to find out more about the certifications we’ve earned. As a company policy, we do not advertise. Our business comes solely from referrals from satisfied customers and business associates. A large portion of our business is due to our troubleshooting skills. We specialize in solving difficult maintenance issues that our competitors may not have the knowledge or experience to handle. If you have a specialized need, we should be able to meet it. Our focus is developing ongoing business relationships with our customers. It is our belief that preventative maintenance is the best procedure to keeping a facility in optimal shape. This is why we encourage our customers to use a maintenance program to minimize costs, simplify payments, and reduce scheduling hassles. We will be happy to create a program tailored to your building’s specific needs.have a difficult flooring problem and would like to know if there is a solution to meet your needs, please pick our brains.